Prefect for singles or couples who have raised their children and are looking forward to a comfortable and relaxed retirement, this empty-nester house plan is worth taking a closer look. Designed all on one level, the floor plan delivers comfortable spaces and practical features like an open floor plan, main level laundry room, walk-in shower in the master bath and a flexible library that easily converts to a guest bedroom when all the grandkids arrive for the weekend. You’ll appreciate the front and rear, covered porches, perfect for visiting with guests while enjoying after dinner drinks outdoors. The vaulted ceilings in the great room and dining area generate a sense of spaciousness making any special gathering open and relaxed. The secondary bedroom in the rear is just right for baby boomers who have an aging relative in their care. The nearby full bath is conveniently located. Efficient features include generous counter space in the pass-thru kitchen, a handy pantry, 2-car garage and ample closet space throughout. The corner fireplace, fanciful ceiling treatment topping the master bedroom and the splashy garden tub are just a few of the elegant extras this ranch house plan has to offer. If you’d like to view other Empty-Nester house plans, please browse The House Plan Shop’s extensive collection. If you have raised your kids and are on the road to retirement or perhaps have already retired, Empty-Nester house plans are for you! They are designed for those who have reached the point in life when it is time to kick back, relax and enjoy past accomplishments and the future. Most Empty-Nester home plans showcase comfortable spaces and practical features that will carry occupants through the next phases of life. 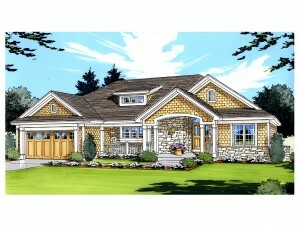 In many cases these thoughtful house plans are designed with one-story allowing for easy, single-level living. Some might be built on finished basements delivering extra living space on the lower level, ideal for those who need extra entertainment space or bedrooms for holiday weekends when the kids and grandkids come to visit. Most Empty-Nester house plans share a few common characteristics and design elements making them appealing to singles and couples of retirement age. They are designed with an open floor plan often combining the living room, kitchen and dining space into one large gathering area. Not only does this arrangement work well for entertaining, but should occupants one day find themselves in need of a walker or wheelchair, this barrier-free layout allows mobility and access to the main parts of the home in a safe manor. Furthermore, many designs enjoy outdoor living spaces such as a screened porch, deck or covered patio. These home plans for retirees generally incorporate a main level master suite with a roomy bath. Frequently, a walk-in shower is included in the bath allowing accessibility for those who may have trouble getting in and out of a bathtub later in life. There is also room for safety features like grab bars near the toilet, shower and bathtub. Sometimes, Empty-Nester floor plans include at least one secondary bedroom room for use as a guest suite when weekend visitors arrive. Flexible spaces are often included with baby boomer friendly house plans like a den or hobby room that can flex as needs or lifestyles change. 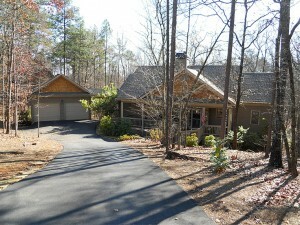 Finally, Empty-Nester house plans are fashioned with comfort and low maintenance in mind. They are designed with easy-to-care-for interiors and exteriors. Take some time and enjoy browsing our Empty-Nester House Plans.